Just a few months ago Manchester United were suffering from Jose Mourinho’s third season syndrome. Results weren’t coming as the Portuguese lashed out at everyone around him. A loss to Liverpool was the final straw: Mourinho was sacked, replaced by Ole Gunnar Solskjaer as caretaker with plans to appoint a permanent manager at the end of the season. The Norwegian’s appointment made good sense: a club legend involved in its most successful period under Sir Alex Ferguson gives a disallusioned fanbase a boost, while the players don’t have to constantly walk around on eggshells. Solskjaer either does well and hands over the team in good shape to his successor or he does poorly and his successor comes in and rebuilds. Solskjaer appears to be doing a little too well though. The Premier League title is an extreme long shot but United are right back in the thick of Champions League qualification as Solskjaer remains unbeaten. With each passing game the idea that Solskjaer should simply hand over the reins to someone like Mauricio Pochettino or Zinedine Zidane and return to Molde in May seems unfair, leaving Ed Woodward with a slightly different headache than Mourinho did. To some extent Solskjaer’s entire point is to not be Mourinho. The Portuguese seemed unable to stop antagonising his players, while the fanbase was split between those who felt he was the proven winner they needed, with a personality that suited the more cynical Top Reds, and those who felt that not only had football left him behind, but that he disrespected United’s traditions. Solskjaer solves those issues without having to make any changes on the pitch. The Norwegian unites the support simply by being himself: it’s hard to argue against a club legend getting a go for a few months. Had he been made permanent manager there would have been question marks after his relegation with Cardiff, but there’s little to complain about when the season looked dead already, so everyone in the stands is pulling in the same direction again. In the dressing room, all Solskjaer has to do to improve on Mourinho is not throw his players under the bus at every opportunity. It’s doesn’t take much digging to find examples of Mourinho’s toxicity. Paul Pogba and Anthony Martial were the two most notable subjects of fall-outs with the manager and now look like new men under Solskjaer, while Luke Shaw underwent such a prolonged campaign that any normal company would have forced staff to attend a bullying in the workplace course by now. Compare this to Mourinho, who blamed his players for their loss against Manchester City: “I told Bailly 20 times, never play a first-station ball. Never. Because this is where they want to press,” Mourinho scoffed. “He did it 20 times during the game.” He singled out Bailly for criticism despite the interviewer asking about the team in general and Bailly’s first station passes not even leading to goals. It’s not exactly difficult to see why a player would prefer to play for the former. “It’s about the players being proud of their performance and the fans being proud of their team,” says Solskjaer. “We’ll just get the players enjoying football, and I’m looking forward to seeing the supporters again. As a result, his style of football aims to put United on the front foot, to encourage his players to take risks where Mourinho would look to eliminate the possiblity of mistakes. This is most obvious in United’s build-up. Under Mourinho, United’s defenders took very few risks, making it more difficult for the players ahead of them to receive the ball. Under Solskjaer, the centre-backs are expected to pass and dribble out into the midfield and the full-backs take up quite high positions. The initial structure involves forming a back three. 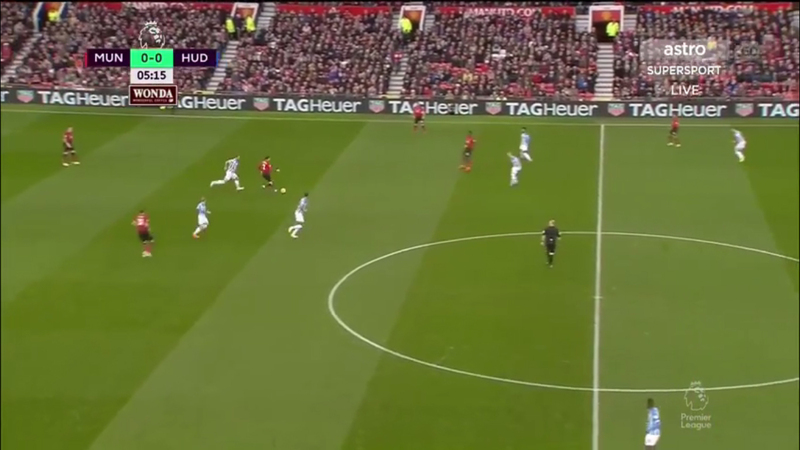 Mostly this is done by the centre-backs splitting wide while the full-backs push on and one of the midfielders drops in between them, however sometimes Shaw stays quite deep on the left, allowing the two midfielders to stay ahead of the defenders. This suits Victor Lindelof’s skillset. The Swede has a good eye for a pass and is confident evading pressure from opposition forwards, while his usual partner Phil Jones is happy to stride forward on the ball if there is space ahead of him. The defenders and midfielders form triangles and pass the ball quickly along the floor, usually moving it on in one or two touches that make it difficult for their opponents to shift across in time to stop them. If there isn’t a passing option open, these players are often expected to drive forward on the ball and create one. In these earliest stages the front three tend to stay quite wide, looking to stretch the opposition defence and provide an option for a direct ball over the top (United also rarely play short from goalkicks, preferring David de Gea to send it straight up to the forwards). This build-up is usually done with the intention of getting Pogba on the ball. United were heavily reliant on the Frenchman creatively under Mourinho, but their difficulty in playing out from the back meant that he was usually having to come very deep to get on the ball, so he struggled to get involved in the final third. Under Solskjaer, the defenders have more responsibility to get the ball to Pogba, meaning he can stay higher up in the opposition half. How to get the best from the then-most expensive player in the world was Mourinho’s biggest headache at United, yet Solskjaer seems to have found a soultion almost immediately. He’s played in a system that has been described as either a 4-3-3 or a 4-2-3-1 and it’s clear to see where the confusion stems from: the players tend to take up positions that form a 4-3-3 shape (Pogba plays from the left side and his partner, typically Ander Herrera although Fred also suits the role, will move forward more often than Nemanja Matic behind them) however the player roles within that shape are more similar to a 4-2-1-3 (the front three stay high, Pogba is given freedom behind them, forcing Herrera into a more defensive role that usually puts him alongside Matic in a double pivot), meaning it can easily look like either. This helps to eliminate the weaker points of Pogba’s game. His lack of defensive awareness (or alternatively his unwillingness to do the less glamorous work) made him a problem in the middle, and Mourinho’s attempts to free him from defensive responsibility by playing him as an attacking midfielder in a 4-2-3-1 rarely worked as he was much less effective playing with his back to goal. Solskjaer’s managed to keep Pogba deep enough that he can play facing the opposition goal and pick out long passes, but has removed the need for him to track back when United lose the ball. 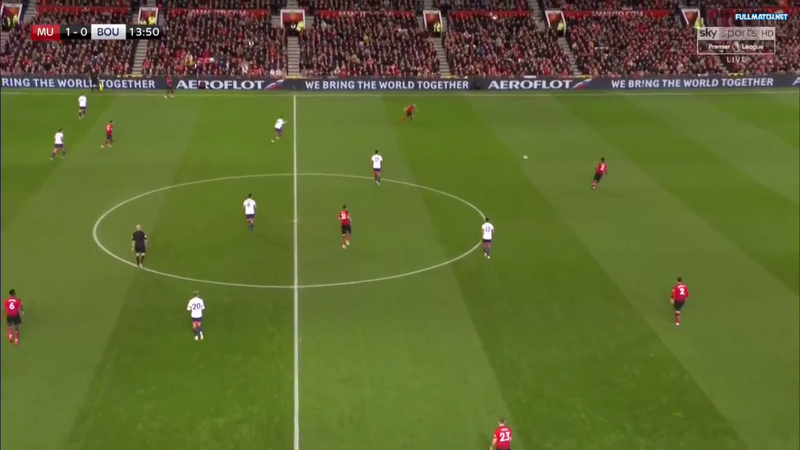 Once the ball is played into the opposition half, United’s structure changes. The right winger, usually Jesse Lingard or Juan Mata, come central, while the right-back gets very high to provide the width on that flank. 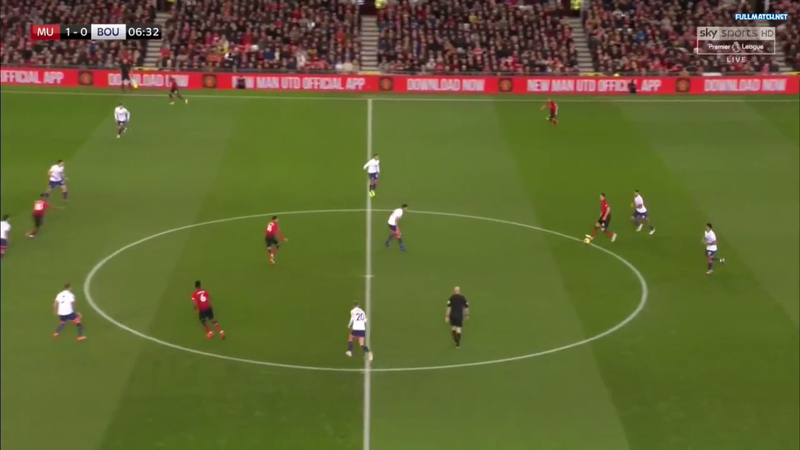 If the ball is played down the right, it often ends in a cross, with plenty of players crowding the box, however if Herrera gets forward or the forwards come across to support the full-back, they are more likely to try and work their way more patiently into the box. The majority of United’s attacks come down the left though. Shaw will get high and wide but less frequently than Ashley Young or Diogo Dalot on the opposite flank because the space ahead of him is often already filled. Martial may stay wide and look to beat the full-back or tuck inside to receive the ball between the lines, with Pogba often making diagonal runs to the touchline if his countryman drops off to receive the ball to feet. Like Pogba, Martial’s attitude to defending didn’t ingratiate himself to Mourinho, however he’s probably only second to Pogba in terms of talent in the squad. He can twist defenders inside out or pick out a pass, making him the most likely player to create a goal out of nothing. Marcus Rashford has also improved significantly under Solskjaer. Unable to hold up the ball to the required standard, Rashford rarely got a run in his preferred central role under Mourinho, more often stuck out on the right. 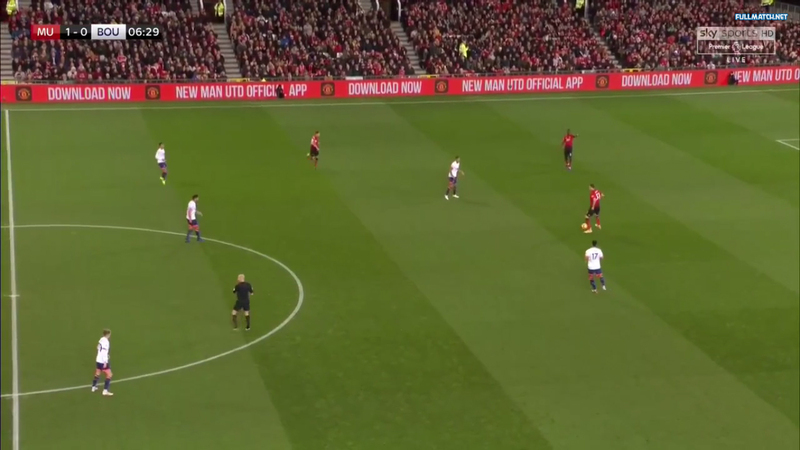 With more players around him to link up with now, Rashford’s more comfortable playing through the centre as he can immediately move the ball on to a nearby teammate rather than holding off defenders. He can drop between the lines to lay off the ball, he can pick up the ball and scare defenders with his pace and dribbling, and, most importantly, he can get in the box and finish off moves. He had just three goals under Mourinho this season yet already has five under Solskjaer. He still has things to work on – his lay-offs to players behind him for example are often too hard, drilled into their feet, rather than lighter passes that allow the recipient to move forward onto the ball and join the attack – but he’s starting to develop again when it looked like he was starting to plateau. His time on the wing had some benefits too. He’s very comfortable pulling out into the channels, allowing him to hold up the ball in a way that puts defenders on the back foot rather than having to outmuscle them with his back to goal, and setting up goals for his teammates. Both Lingard and Mata suit coming across to help link play, performing neat little touches and passes, but the former is better-suited, with the latter’s lack of pace really starting to show. 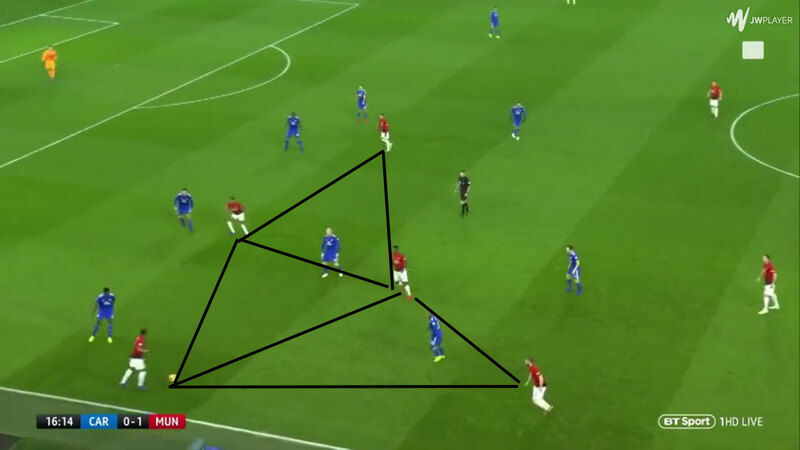 United’s attacks usually involve them forming small triangles and passing amongst themselves in quick one-touch moves, too fast for the defenders to get near them. It obviously requires good technique but Pogba, Martial, Rashford, Lingard and Shaw are all up to the task in these tight spaces, while Matic is available behind them if an attack breaks down. United flood the left side of the pitch and pass quickly in small triangles. The right-back maintains the width on the right. Solskjaer’s also had more success than Mourinho in getting United to counter-attack successfully, choosing more direct gameplans for the tougher games against Tottenham Hotspur and Arsenal. His answer to this problem was quite simple: playing with three fast forwards and allowing them to stay high up the pitch rather than tracking back deep into their own half. When United won back the ball, they would typically look to get it quickly to Pogba, who would send a long pass forward into the path of the pacey attackers before the opposition could recover. The central role of Lingard in the wins over Tottenham and Arsenal had many describing United’s formation as a 4-4-2 diamond, but truthfully there was little difference between that and their usual 4-3-3 set-up. 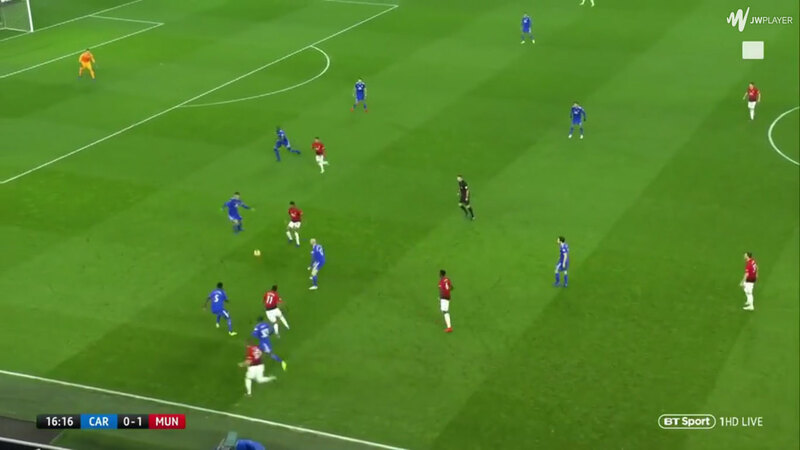 Lingard would drop off and link play but not anymore than Rashford did in the middle, and much of his role was still about running in behind the opposition backline. Instead the switch seemed to be about keeping the Spurs and Arsenal defences stretched. 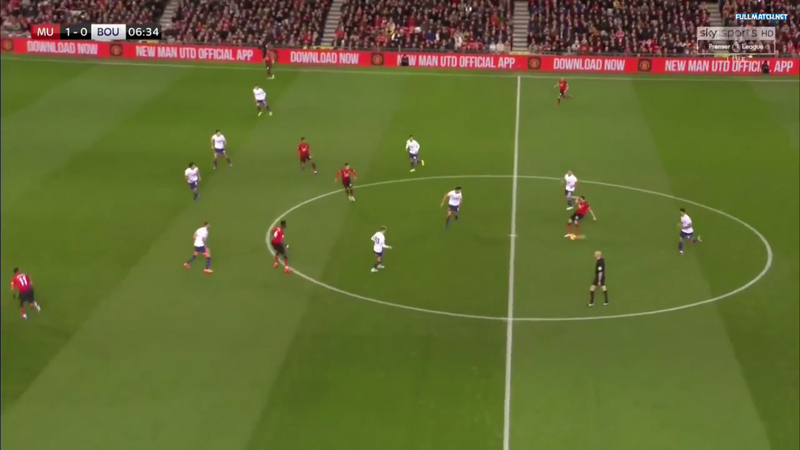 Rather than having Lingard tuck in off the right into the middle, Solskjaer instead let him start there and moved Rashford and then Romelu Lukaku out to the flank to keep the width, giving the wingers space to attack if the opposition full-backs pushed forward and pulling apart the two opposition centre-backs. Neither Alexis Sanchez or Lukaku have played much under the new manager. It could be that Solskjaer simply prefers Rashford, Lingard and Martial in attack – Sanchez is quick and gifted but has been in poor form, while Lukaku is athletic and intelligent but can be found lacking technically, not ideal for United’s quick passing triangles – however it could jut as easily be their work without the ball that has seen them dropped. Some of United’s brightest performances earlier in the season came when they were more proactive in defence, so Solskjaer has ensured they now defend higher up the pitch. United press with man-orientations: the wingers will stay near the opposition full-backs, Pogba will get tight to the deepest midfielder while Herrera will push up as well if there’s a second deep midfielder. Rashford will close down the centre-back, curving his run to force them towards the wing. Once the ball is passed out to the flank, United’s full-back on that side will rush out to get tight to the opposition winger and the defensive midfielder will get tight to any midfielder inside. United also now counter-press. The small passing triangles they use in attack mean that there are always plenty of men around the ball when it’s lost, meaning they can immediately get on top of the opposition. This attacking structure is covered by a box at the team’s base, the two centre-backs with the two defensive midfielders in front of them. The ball is returned to Herrera at the base to restart the attack. Matic and Herrera have both been providing cover in case the press falters. As a result, most teams simply look to hit long balls to their forwards rather than risk losing the ball in dangerous areas, which is much easier for United’s backline to defend. Lack of playing time means we can’t judge how Sanchez fits into the system accurately. He’s always a hard-working willing runner, yet he can also be quite selfish in his pressing, rushing around closing the man on the ball at both Arsenal and United in a way that can disrupt the structure of his own team and enable the opposition to play through. Lukaku played well against Arsenal in a right-sided role, however his return to the middle against Burnley didn’t work. This was in part because of his much worse pressing than Rashford, which meant United didn’t impose themselves on Burnley as much as they usually would with Rashford spearheading the attack. 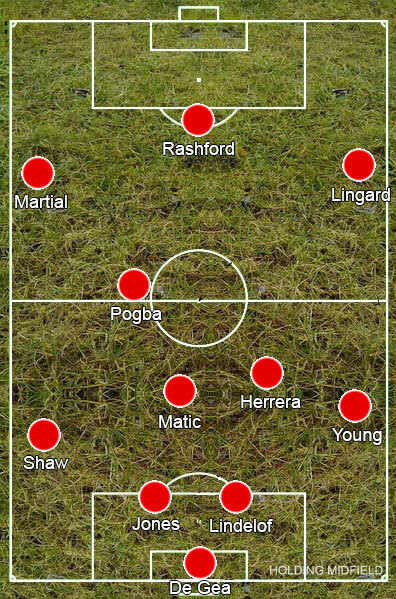 If the press is broken, United drop back into a 4-3-3 shape. Pogba will take up a position alongside the other midfielders but his responsibilites aren’t the same. He will close down players in his immediate area and plug gaps through his positioning, however there’s little expectation for him to track runners. Most of Pogba’s defensive work is in front of him, which plays more to his strengths. He can cover ground quickly in closing down defenders and is strong in the tackle. As Pogba doesn’t provide true defensive cover, it’s the job of Matic to cover behind him. In an ordinary 4-3-3 this would probably pose problems as Matic doesn’t really have the mobility to cover so much ground, but in United’s set-up he may start centrally yet he only really defends the left side of the pitch, as Herrera drops in alongside him to defend the right side. With United directing their opposition to the wings, the full-backs will rush out to meet the opponent and Matic or Herrera will drop into the space that opens up between the United centre-back and full-back, plugging the exploitable gap. In truth it’s difficult to properly assess United’s defending at this point though. United had a relatively easy run of games where they dominated possession against teams that were mostly happy to play directly, while they were heavily reliant on De Gea to get three points at Spurs. Most of their conceded goals have come from set-pieces, which could be attributed to their weak backline but also to the fact that Solskjaer probably has bigger priorities than working on set-pieces this early in his tenure. That they are dominating teams is a sign of progress though. Mourinho’s risk-averse approach meant that the team would spend long periods of matches defending, whereas under Solskjaer United are mostly in possession, meaning the opposition get far less opportunity to get at the backline – attack being United’s best form of defence. Solskjaer has undoubtedly done an excellent job since taking over from Mourinho, playing the kind of football that United fans want and getting results while doing it. United are still adapting to a more possession-based style but they have the basics down already, moving the ball quickly and with purpose. Solskjaer remains an unkown at this level though and making him the permanent manager is a risk when their rivals are coached by some of the world’s best. The Norwegian can only do his best to convince the board that he is of the same quality if given the chance, and if he manages to rescue Champions League qualification from a season that looked over before Christmas it’s hard to argue against him.